From St. Louis, Missouri, Mrs. 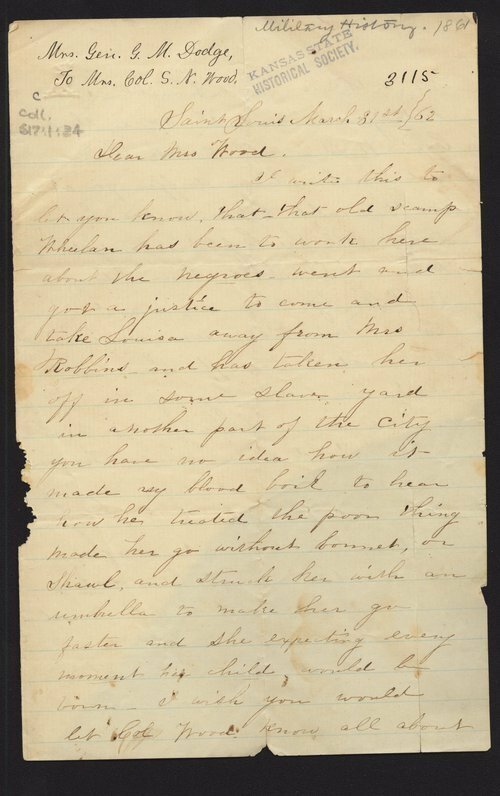 Dodge writes her friend Mrs. S. N. Wood about how a Mr. Wheelan has taken Mrs. Robbins' slave Louisa to a "slave yard." Mrs. Dodge is outraged about how Louisa was treated and wants Mrs. Wood to have her husband, a Lieutenant Colonel in the "Freemont's Battalion, catch Wheelan. Mrs. Dodge indicates that her husband General Dodge is ill but hopes that he will improve with rest. The locator History Military is also called Collection 617 and this item is in Box 1, folder labeled letters. Creator: Dodge, Mrs. Grenville M.